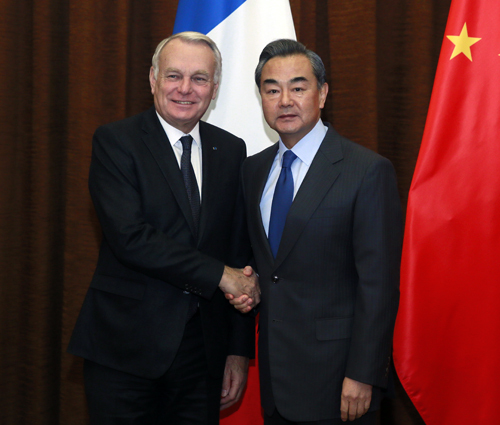 On October 31, 2016, Foreign Minister Wang Yi held talks in Beijing with visiting Foreign Minister Jean-Marc Ayrault of France. Wang Yi noted that China-France relations maintain a good momentum at present. Both sides enjoy frequent high-level exchanges, continuing highlights in practical cooperation and great headway in such major programs as energy, aviation and ecology. The two countries are deepening people-to-people and cultural exchanges, carrying out sound cooperation in global governance, and maintaining communication and coordination in international and regional hotspot issues. President Xi Jinping held a successful meeting with President Francois Hollande during the G20 Hangzhou Summit, which injects new vitality into the development of China-France relations. Both sides should well implement the important consensus reached by the two heads of state, strengthen communication and work together to push for the healthy and stable development of China-France relations, and add new connotations to China-France comprehensive strategic partnership. China supports the European integration process and stands ready to work with the EU to deepen the development of China-EU relations. Jean-Marc Ayrault stated that France-China relations maintain high-level development and both sides cooperate in extensive areas with fruitful achievements. France welcomes Chinese enterprises to make investment in France. As both sides will respectively address important domestic political agendas next year, the two countries should strengthen strategic communication to ensure policy continuity. France is fully confident in the future of bilateral relations and will continue to promote the in-depth development of France-China comprehensive strategic partnership. Wang Yi agreed with Jean-Marc Ayrault's positive comments on China-France relations. He introduced to the French side the important decisions and major achievements made in the 6th plenary session of the 18th Communist Party of China Central Committee. Wang Yi also expressed China's willingness to enhance strategic mutual trust and deepen strategic cooperation with France so as to propel China-France relations to a new height. Wang Yi and Jean-Marc Ayrault have reached extensive consensus on China-France relations and practical cooperation in the next stage. Both sides agreed to maintain high-quality high-level exchanges, well hold bilateral institutional dialogues, carry forward traditional friendship, respect and support each other, and accommodate each other's core interests and major concern, for the sake of better and faster development of China-France relations. Both sides agreed to comprehensively deepen and expand practical economic and trade cooperation, and focus on cooperation in major programs and key areas. Both sides are committed to deepening cooperation in the whole industry chain of nuclear energy, strengthening cooperation in trade, investment, and finance, pushing forward third-party market cooperation and local cooperation in a solid way, forging ahead the "Belt and Road" construction, and tapping greater room and potential for mutually beneficial cooperation. Both sides agreed to actively carry out people-to-people and cultural exchanges so as to lay a solid public opinion foundation for China-France relations. Both sides will well implement cooperation projects in education, technology, culture, health, sports, tourism and other areas, further improve the level of convenience for personnel exchanges, and advance communication between people of the two countries, young people in particular. Both sides agreed to maintain communication and coordination in international affairs, play a leading role in issues including climate change and global economic governance, push forward the effective and comprehensive implementation of the Paris Agreement and achievements made in the G20 Hangzhou Summit and continue to play a positive role in the peaceful settlement of international and regional hotspot issues. Both sides also exchanged views on international and regional hotspot issues of common concern, including the Syrian issue, the Palestine-Israel issue and the Korean Peninsula situation.